Capable of reducing a single sheet of paper into over 15,500 tiny particles, the Dahle 40534 High Security Level P-7 Micro Cut Paper Shredder was designed for military, federal, state or local governments as well as Department of Defense contractors. You can be assured your most sensitive information will be completely destroyed, keeping it out of the wrong hands. The built in EvenFlow lubrication system automatically oils the entire cutting mechanism, reducing wear on the precision milled cutting cylinders and risk of a paper jam, while ensuring optimal shred capacity and performance. The Dahle 40534 Micro Cut paper shredder features an easy-to-use command dial which controls all of the shredder's functions such as power up, reverse, and continuous run. Plus, SmartPower Energy Management reduces power consumption after ten minutes of sitting idle (sleep mode), and completely powers down after an additional 20 minutes of inactivity. The Dahle 40534 Level P-7 Micro Cut Paper Shredder offers the greatest protection available, giving you peace of mind. Designed to shred between 100 and 400 sheets per day. The 40534 offers quick and easy destruction of confidential materials. Transcript: This is the Dahle Level P-7 40534 Small Department Shredder! Turning it on puts it in standby mode to automatically start and stop shredding up to 8 pages. The opening is 12” inches wide, easily fitting the length of a standard page. This is the Dahle Level P-7 40534 Small Department Shredder! 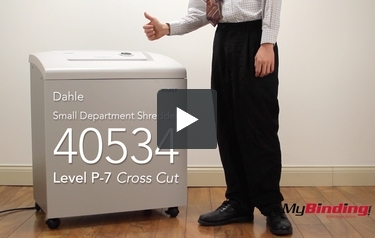 The 40534 is a level 6 micro-cut shredder so it will give you the highest possible amount of security. This device will turn your paper into miniscule shreds that measure 1 millimeter by 4.7 millimeters so you can easily protect personal and proprietary information. The feed opening is 12" wide to accommodate large and small documents. This shredder can process up to 12 sheets at once. While this may not seem like a lot, it's important to remember that cross- and micro-cut machines typically have lower shredding capacities since they cut the paper twice. So it's basically a tradeoff. The 40534 has a thermally protected motor that can run continuously without overheating. Thus, you will be able to shred are much as you need to during the day. The waste bin can hold up to 38 gallons of shreds and you can use gusseted bags to increase that capacity. Maintaining this shredder is easy because it has an EvenFlow automatic oiling system. All you need to do is make sure there is oil in the reservoir and the machine will oil itself as needed. You will also be able to save power since this machine has a SmartPower system. The system will kick in when the machine is idle and reduce your energy consumption. If you don't use the shredder for 20 minutes, it will shut down completely. If you're worried about this machine making too much noise, you will be glad to know that the motor sits in a wooden cabinet. The wood helps muffle the sounds so you and your co-workers can stay focused. The 40534's cutters are backed by a lifetime warranty. As a unit, the shredder is covered for 2 years. This shredder won't shred multimedia items such as CD's and DVD's. It's meant for destroying paper only. Since the 40534 has such a large waste bin, it will take up a lot of room in your office. Its dimensions are 34.5" x 29" x 20", so be prepared to clear out some space for it.